Hand sewing needs a knot at the end of the thread so that your thread stays in the fabric rather than being pulled out of the fabric as you sew. Getting the hang of a knotting the thread so that it is not a massive tangle of thread can be challenging but it doesn't have to be! Your goal is to create a knot in the end of the hand sewing thread that is large enough to not slid through the fabric but not so large that it is a tangled mess of thread that is visible through the fabric or laving loops of thread that can be caught on fingers or toes as you wear a garment. Practice a few times to get the hang of knotting the end of your hand sewing thread...the worst thing that can happen is that you waste a couple feet of thread, which is a small price to pay in comparison to an unsightly mess or the thread coming out of the fabric..
Wrap the thread around the pointer finger. Using your thumb, slide the threads together towards the end of your pointer finger, with the thread between your fingers. The threads will wrap around each other as they travel toward the end of your pointer finger. 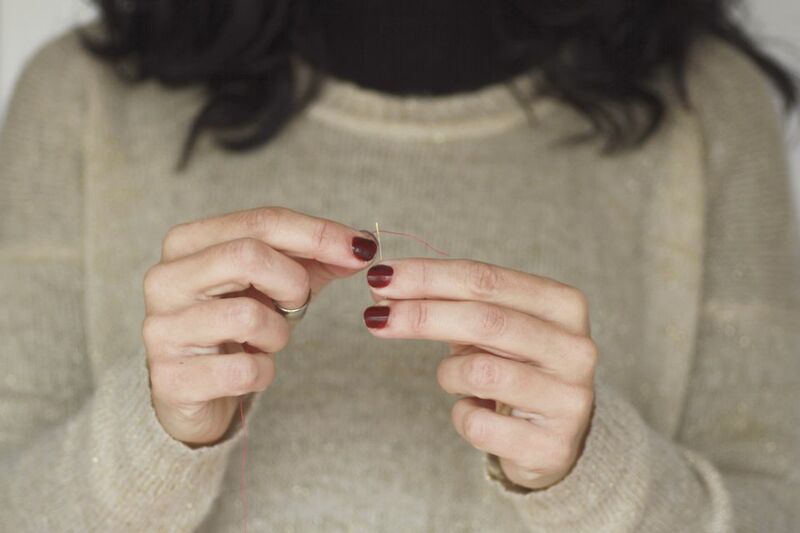 Using the end of your pointer finger and thumb, gently slide the knot to the end of the thread. Tug the thread to tighten the knot. Trim any excess thread that may remain past the knot, unless you are doing a project that requires a thread tail, in which case leave the tail intact. Projects such as the soft sculpture Mr. and Mrs. Santa Ornaments, often use the thread tail. Button and Carpet Thread Information Central!